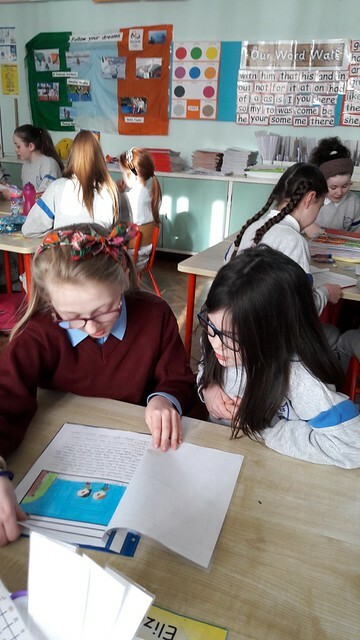 Inspired by an idea for World Book Day, Mrs. Kearney's class decided to write their own personal stories for the girls in Ms. Flynn's 1st class. The 6th class girls had also built up a rapport with the younger children as they had been listening to their reading every Friday for the past few months. In preparation for writing the story, they interviewed a child in order to find out a bit more about them; their interests/ hobbies, friends and family. The information they gathered was sprinkled throughout the story they created; much to the delight of the younger children. It was a very worthwhile exercise and thanks to Mrs. Kearney and her girls for their unique stories. Untitled from Killester on Vimeo.